Photo: KayVee.INC. Creative Commons BY-NC (cropped). As production (real GDP) grows, its marginal utility declines, because we satisfy our most important needs first. Likewise, the marginal disutilitiy inflicted by growth increases, because as the economy expands into the ecosphere we sacrifice our least important ecological services first (to the extent we know them). These rising costs and declining benefits of growth at the margin are depicted in the diagram below. From the diagram we can distinguish three concepts of limits to growth. The “futility limit” occurs when marginal utility of production falls to zero. Even with no cost of production, there is a limit to how much we can consume and still enjoy it. There is a limit to how many goods we can enjoy in a given time period, as well as a limit to our stomachs and to the sensory capacity of our nervous systems. In a world with considerable poverty, and in which the poor observe the rich apparently still enjoying their extra wealth, this futility limit is thought to be far away, not only for the poor, but for everyone. By its “non satiety” postulate neoclassical economics formally denies the concept of the futility limit. However, the relevance of the futility limit is strengthened by studies showing that, beyond a threshold, self-evaluated happiness (total utility) ceases to increase with GDP. The “ecological catastrophe limit” is represented by a sharp increase to the vertical of the marginal cost curve. Some human activity, or novel combination of activities, may induce a chain reaction, or tipping point, and collapse our ecological niche. The leading candidate for the catastrophe limit at present is runaway climate change induced by greenhouse gasses emitted in pursuit of economic growth. Where along the horizontal axis it might occur is uncertain. I should note that the assumption of a continuously and smoothly increasing marginal cost (disutility) curve is quite optimistic. 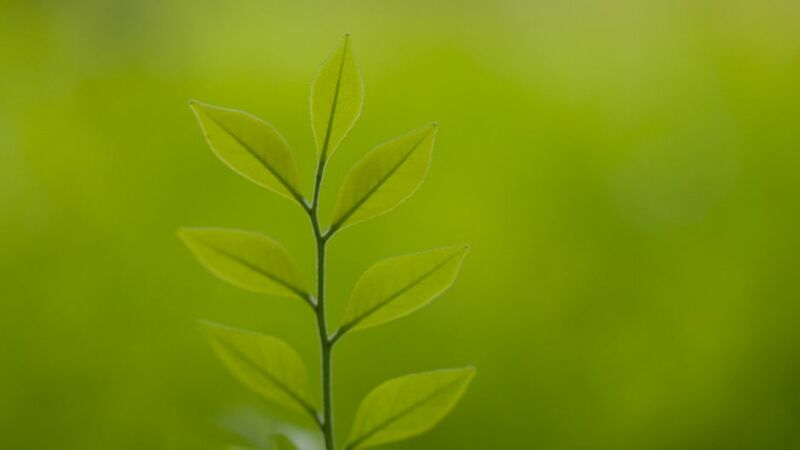 Given our limited understanding of how the ecosystem functions, we cannot be sure that we have correctly sequenced our growth-imposed sacrifices of ecological services from least to most important. In making way for growth, we may ignorantly sacrifice a vital ecosystem service ahead of a trivial one. Thus the marginal cost curve might in reality zig-zag up and down discontinuously, making it difficult to separate the catastrophe limit from the third and most important limit, namely the economic limit. The “economic limit” is defined by marginal cost equal to marginal benefit and the consequent maximization of net benefit. The good thing about the economic limit is that it would appear to be the first limit encountered. It certainly occurs before the futility limit, and likely before the catastrophe limit, although as just noted that is uncertain. At worst the catastrophe limit might coincide with and discontinuously determine the economic limit. Therefore it is very important to estimate the risks of catastrophe and include them as costs counted in the disutility curve, as far as possible. From the graph it is evident that increasing production and consumption is rightly called economic growth only up to the economic limit. Beyond that point it becomes uneconomic growth because it increases costs by more than benefits, making us poorer, not richer. Unfortunately it seems that we perversely continue to call it economic growth! Indeed, you will not find the term “uneconomic growth” in any textbook in macroeconomics. Any increase in real GDP is called “economic growth” even if it increases costs faster than benefits. Economists will note that the logic just employed is familiar in microeconomics — marginal cost equal to marginal benefit defines the optimal size of a microeconomic unit, be it a firm or household. That logic is not usually applied to the macro-economy, however, because the latter is thought to be the Whole rather than a Part. When a Part expands into the finite Whole, it imposes an opportunity cost on other Parts that must shrink to make room for it. When the Whole itself expands, it is thought to impose no opportunity cost because it displaces nothing, presumably expanding into the void. But the macro-economy is not the Whole. It too is a Part, a part of the larger natural economy, the ecosphere, and its growth does inflict opportunity costs on the finite Whole that must be counted. Ignoring this fact leads many economists to believe that growth in GDP could never be uneconomic. 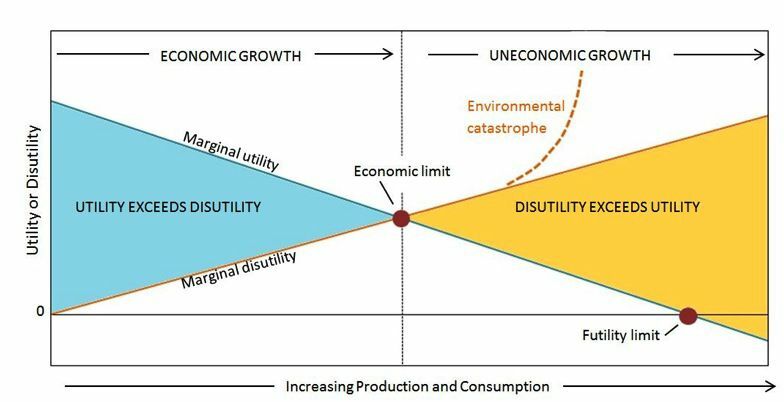 Standard economists might accept this diagram as a static picture, but argue that in a dynamic world technology will shift the marginal benefit curve upward and the marginal cost curve downward, moving their intersection (economic limit) ever to the right, so that continual growth remains both desirable and possible. However, the macroeconomic curve-shifters need to remember three things. First, the physically growing macro-economy is still limited by its displacement of the finite ecosphere, and by the entropic nature of its maintenance throughput. Second, the timing of new technology is uncertain. The expected technology may not be invented or come on line until after we have passed the economic limit. Do we then endure uneconomic growth while waiting and hoping for the curves to shift? Third, let us remember that the curves can also shift in the wrong directions, moving the economic limit back to the left. Did the technological advances of tetraethyl lead and chlorofluorocarbons shift the cost curve down or up? How about nuclear power? Adopting a steady state economy allows us to avoid being shoved past the economic limit. We could take our time to evaluate new technology rather than letting it blindly push growth that may well be uneconomic. And the steady state gives us some insurance against the risks of ecological catastrophe that increase with growthism and technological impatience. Three Limits to Growth by Herman Daly is licensed under a Creative Commons Attribution-NonCommercial-NoDerivatives 4.0 International License. Permissions beyond the scope of this license may be available at The Daly News. Herman Daly is a professor emeritus at the University of Maryland, School of Public Policy. From 1988 to 1994 he was a senior economist at the World Bank. Prior to that he was a professor of economics at Louisiana State University. He holds a B.A. from Rice University and a Ph.D. from Vanderbilt University. He co-founded the journal Ecological Economics. He has written many articles and books, including Steady-State Economics, For the Common Good (with John Cobb), Valuing the Earth, Beyond Growth, Ecological Economics (with Josh Farley), and Ecological Economics and Sustainable Development. Prof. Daly is a recipient of Sweden’s Honorary Right Livelihood Award, the Heineken Prize for Environmental Science, the Leontief Prize, the Medal of the Presidency of the Italian Republic, and the NCSE Lifetime Achievement Award. He writes regularly on the Daly News blog of the The Center for the Advancement of the Steady State Economy.